Jaime Tardy knew no one in the publishing industry when she set her sights on publishing a book. A business coach, blogger and podcaster, Tardy was best known at the time as the founder of the Eventual Millionaire blog and podcast, where she interviews successful millionaire entrepreneurs. 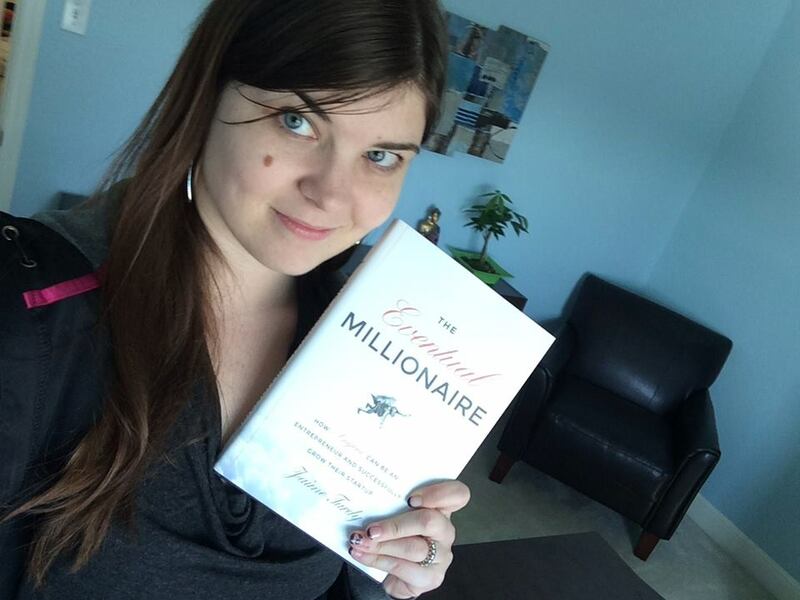 Her first book, The Eventual Millionaire: How Anyone Can Be An Entrepreneur and Successfully Grow Their Startup (Wiley, February 24, 2014) is based on Tardy's interviews with over 100 millionaires, and examines how entrepreneurs can use a business to build wealth. When Tardy set a goal in early 2012 to become a published author, she started by discussing the idea with business colleagues and figuring out what writing and publishing a book would mean to her business. A few months later, a literary agent contacted her. "I don't know if it was straight up manifestation because I was thinking about what steps I needed to take to get a book deal, but I received an email from an agent saying they'd seen my website and were interested in speaking with me," she says. "I did a little research and quickly found out that this agent had brought some very reputable books to market and we started discussing how we could work together." At the same time, Tardy examined going with a traditional publishing deal versus self-publishing. With the rise of self-publishing she knew that was a viable option that may help her get to market faster. After speaking with a number of authors, Tardy was clear that she wanted to work with a publisher as it would help boost her position as a speaker and coach. Tardy credits the fact that she had built a strong personal brand through her Eventual Millionaire web site and press interviews with how she attracted a literary agent. Having a platform in place, she had a lot to bring to the table when it was time to select an agent and negotiate a book deal. In her years as a coach, Tardy had built a strong network that she relied on heavily going through the process of securing her book deal. She started by contacting people she knew who had a book deal and discussing their experiences with their agents to see if she should stick with the person who approached her or explore other options. "I quickly realized that the agent who approached me was a great fit as he focuses on working with first-time authors," she says. "In doing my research it was clear that I really didn't know much about getting a book deal, and I needed an agent who would be willing to hold my hand through the process." Over the summer of 2012, Tardy worked on her book proposal. It was a four-month ordeal which required her to define her target market, find supporters for the book should it be published, and map out marketing plans. "The book proposal process took nearly as long as it did to write the actual book," says Tardy. "I activated my professional network to help me get all the pieces in place. By the end of the proposal process, I was able to demonstrate reach to hundreds of thousands of people through my supporters." That was a win when it was time to negotiate, says Tardy. "The publisher cares most about how many books you can sell." The completed proposal was submitted to eight publishers and then the waiting started. The book was picked up by Wiley in late 2012. Before starting negotiations with Wiley, Tardy talked to other authors about the amount of their advance and how long they had to deliver the book. "I wanted to go into negotiations with a clear picture of what to expect and how to get the best possible deal I could," says Tardy. "My mentor had given me the advice at the start of this entire thing that a book isn't a business so I knew I had to make sure that there was room to keep doing my day-to-day business as I wrote the book." Tardy was happy with the end result. "The deal gave me an advance I was very comfortable with and six months to write the book." Tardy spent most of 2013 writing the first draft and going through the editing process with Wiley. She also created an "Insiders Group" of about 15 people who gave her feedback and suggestions on the book throughout the process. The book was finalized in November and hit the shelves February 24th. When asked about her lessons learned from the nearly two-year long process of securing a book deal and getting into print, Tardy emphasizes the importance of building a personal platform before going after a book deal. "As coaches, consultants and entrepreneurs, we all talk about the power of a personal platform, but this entire process has taught me just how important it is. My platform was the lynchpin of this entire thing from attracting an agent and publisher to negotiating the book deal," says Tardy. "Having a strong brand and network meant I came to something with the table. I cannot emphasize enough how building a platform is a must if you want to author a book." Maggie Patterson works with coaches, consultants and speakers to help them build their expert platform through communications strategy and copywriting that meets business goals. You can connect with Maggie (@magspatterson) on Twitter. John Corcoran is an attorney, former Clinton White House Writer, and founder of SmartBusinessRevolution.com, where he shows entrepreneurs and business owners how to use relationships to grow their business. You can download his free ebook How to Increase Your Income in 14 Days by Building Relationships with VIPs, Even if you Hate Networking.